Transparency Market Research (TMR) says that the global high voltage measuring equipment market renders a low degree of competition as only a handful of players have the expertise to manufacture high voltage measuring equipment. Due to the complexity of the end product, a limited number of manufacturers are capable of manufacturing them. Some of the top companies in the global high voltage measuring equipment market include GE Grid Solution, ABB, Siemens, Crompton Greaves, and Schnieder Electric. 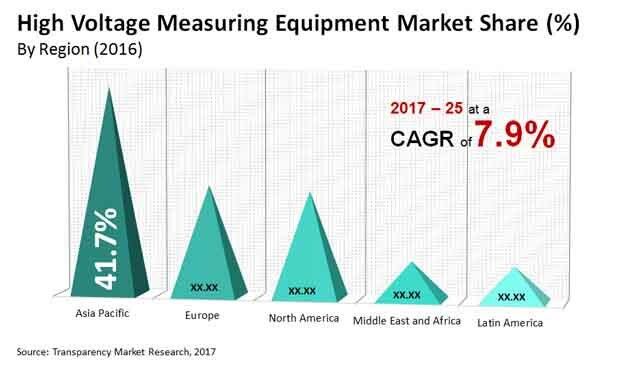 The global high voltage measuring equipment market displayed an opportunity of US$3.36 bn in 2015 and is expected to be worth US$6.59 bn by 2024 at a CAGR of 7.9% between 2016 and 2024. In terms of application, power transmission held a significant share in the global high voltage measuring equipment market in 2015 and is expected to display a promising 8.1% CAGR between 2016 and 2024. Power generation (substation) is expected to be second leading segment during the forecast period due to investments at par with the power transmission segment but with a lower volume of requirement. On the other hand, the industrial segment is anticipated to rise at a comparatively slower rate due to uncertainty pertaining to investments in various regions and countries. Capacitive voltage transformers stood as an attractive product segment in the global market for high voltage measuring equipment market in 2015. This is because capacitive voltage transformers are suitable for all a multitude of applications and are available for a wide voltage spectrum. On the other hand, potential transformers are expected to display comparatively slow growth due to their capacity limitation. Among the others product segments, capacitors are expected to display a higher growth rate as they are extensively used in power transmission grids and in power generation (substation) applications. The others product segment is expected to rise at a slow growth rate and display a negligible drop in its market share. Alternating current led the market in terms of volume in 2015 and is expected to be an attractive current segment between 2016 and 2024. In 2015, Asia Pacific, North America, and Europe held significant shares in the global high voltage measuring equipment market. Asia Pacific, among these, held a major share in the global market in 2015 and the trend is expected to continue over the forecast period as well. Massive investments expected from China for development of new transmission grids is one of the primary factors for the lead position of this region. Moreover, government efforts to provide electricity in the remotest areas is displaying demand for high voltage measuring equipment. On the other hand, Europe and North America are mature markets and their market shares are expected to decline during the forecast period. Low incentives received by governments for investing in transmission grids will act as a hurdle to the growth of these regional markets. Nevertheless, trend of replacement of old equipment and upgrade of equipment to satisfy stricter environmental regulations will present growth opportunities to the markets of North America and Europe. First-time access to electricity and interconnection of isolated grids are the primary factors driving the high voltage measuring equipment market. Moreover, addition of renewable energy plants and increasing demand for electricity from industrial and other sectors are expected to further boost the high voltage measuring equipment market. On the flip side, high investments and low returns in transmission grids, political and aesthetics-related concerns, and environmental concerns are restraining the market’s growth.